Compared to moose, or even plains bison, very few people have ever been injured by wild wood bison. There is a chance, however, that one could be startled and put a person in danger, so ADF&G is working with village residents to minimize that risk. A few wood bison have visited the village of Shageluk and the airports at Shageluk and Grayling. Bison roll in dirt to protect themselves from insects. They appear to like the dirt roads and areas where construction activities have created exposed dirt. None of the bison has shown any aggressive behavior, and appear to be indifferent to people. As long as people do not approach the bison they are unlikely to approach people. Efforts are underway to train bison to stay away from airports and villages. Some “aversive conditioning” has been used to help bison learn that runways and towns are negative places. Selected residents of villages are being trained as “bison guards.” They will accompany bison as they move through the village or airport, notify the community and ADF&G, and also help move the bison away from town or the runway. 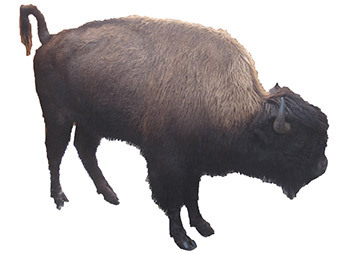 If a bison raises its tail in an arc above the plane of its back it is getting agitated. This bison is agitated and is warning other bison or people to move away. Do not approach bison, keep dogs away, and don’t throw things at them. As with moose and other wildlife, keep a safe distance from bison and have a potential escape route identified. If you find yourself too close to a bison, do not run. Back away slowly. Stops what it’s doing and looks at you or turns to face you. Swings its head back and forth while staring at you. Paws at the ground or hooks the ground with its horns. Makes short bluff charges at you or snorts loudly. If you have questions be sure to call! We want people in the region to feel safe and know how to safely enjoy the wood bison. 907-459-7235 or 459-7206.